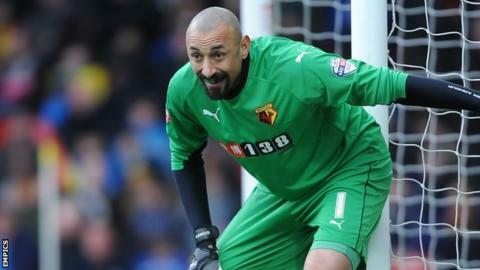 Watford goalkeeper Heurelho Gomes has signed a new three-year deal. The 34-year-old Brazilian kept 15 clean sheets in 44 league appearances for the Hornets this season as they won promotion back to the Premier League. He finished as runner-up to striker Troy Deeney in the voting for the club's player of the season award. Gomes moved to Vicarage Road in May 2014 after previously making 136 appearances for Tottenham, having joined them from PSV Eindhoven. Watford academy graduates Josh Doherty, Alex Jakubiak and Jorell Johnson have all extended their deals with the club for another year. Another academy product, Luke O'Nien, has been released, as have Marco Motta and Vujadin Savic after they reached the end of their short-term contracts. The futures of long-serving full-back Lloyd Doyley and third-choice goalkeeper Rene Gilmartin are still to be decided.